Published Dec 4, 2017 by Addison-Wesley Professional. Part of the LiveLessons series. Cloud Foundry BOSH Fundamentals will teach you how to make use of BOSH 2.0 to automate every aspect of your deployment operations. You’ll learn the fundamentals of using BOSH with existing BOSH releases, and how to create your own releases to deploy your own customized software. In this lesson, you’ll learn what makes BOSH unique, its core philosophies and concepts. You’ll also learn BOSH and general Cloud vocabulary, and will get pointers of where to get help in the future. This lesson covers the steps needed to deploy our bosh director, which you’ll later use to deploy your production software. The lesson walks through preparing your GCP project and networks, deploying the BOSH director by hand, and accessing the director remotely. Finally, you learn how to deploy the director using the new BOSH Bootloader tool. Now that you have a running bosh director, it’s time to provision your first production deployment. The lesson starts simple, by deploying a single virtual machine running Nginx. You then learn how to upload stem cells and releases. You then configure your Nginx deploy manifest and your cloud config. Finally, we’ll deploy the release, and spend some time exploring what we’ve produced. This lesson explores how BOSH manages a clustered release with persistent disks by deploying Etcd. You’ll upload and configure an Etcd release and deploy it to Google Cloud Platform. You then connect to it and ensure replication is happening correctly, and spend some time exploring this clustered release. This lesson covers some of the day to day BOSH tasks. You’ll learn how to apply a security patch to all of our VMs at once, how to monitor our deployments, how to manage the processes running on our VMs, scaling the cluster, and reconfiguring the software that’s running on the VMs. This lesson explores some more advanced BOSH usage. You’ll learn how to colocate deployment to run multiple jobs on a single VM. You’ll also learn how to use BOSH add-ons to automatically colocate jobs on all VMs in all of our deployments. Finally, we explore the BOSH resurrector, a crucial part of the self-healing nature of BOSH. This lesson takes you step-by-step through the process of building a frontend to Etcd and packaging it up in our own custom release. First, you’ll initialize the release directory, and then you’ll write the frontend server. Next, you will create the package files and jobs and learn how to manage large files as local blobs. After that, you’ll review what we’ve built so far and explore the development cycle in building a release. 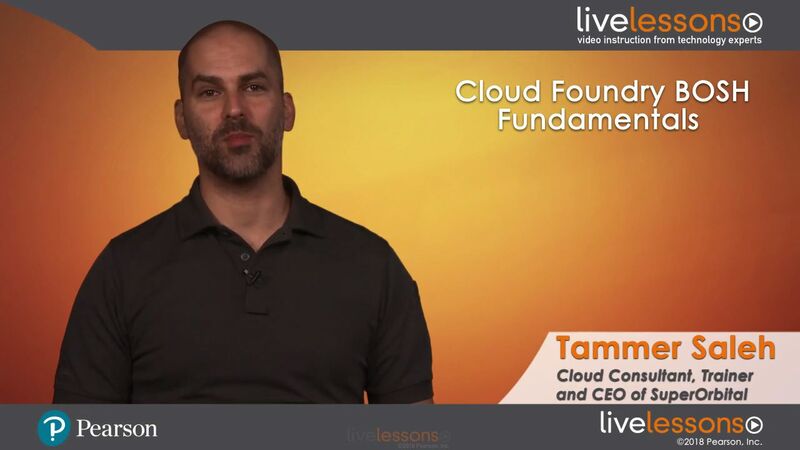 Then, you will build and deploy your release, learn how to configure a GCP load balancer for it, and review the entire deployment. You’ll finish off by making use of bosh links to make it easier to configure and manage our release.